The sun is shining and as I plan my summer vacation one of my toughest decisions is figuring out which books I want to load up on my ereader for poolside perusing, campsite lounging, or airplane reading. At the end of March, EJ Russell released the second book in a series that is a must add for your summer reading list. Tested in Fire is the second installment of her Art Medium books that follow the lives of artist Stefan Cobbe and his boyfriend, art investigator Luke Morganstern. I managed to catch up with Ms. Russell in between deadlines to ask her a few questions about her thoroughly lovely series and two of my favorite lead characters. C. Morgan Kennedy (CMK): I’m always curious as to why authors are drawn <pun intended> to their subject matters. So…why paranormal? Why contemporary? Good question, C! It really comes down to what I love to read. I’m a voracious reader—it’s my chief form of recreation. Before I really discovered modern romance (thank you, Kindle gen one, and book bundles! ), my reading pattern was cyclical. First, I’d be on a Jane Austen/Georgette Heyer binge. Then one day, I’d think, “Time for a change,” and it would be all fantasy/sci fi, all the time. Then I’d hit the wall and dive into mysteries. Rinse. Repeat. That changed to some extent with the Great Romance Discovery, however I never shook my original reading patterns. So historical, contemporary, and paranormal romances are the stars of my TBR pile. Once I started writing again (I hadn’t really done anything other than expository or business writing since sixth grade. The California school system. What can I say? ), my preferences were set! I write in three basic flavors: contemporary (with a definite rom-com bent, because if it’s not fun, why bother? ), paranormal romantic comedy, and supernatural romantic suspense (which is where the Art Medium series falls.) I haven’t written a historical yet, although I’ve got one planned. Not a Regency, though—I’m too intimidated by all the amazing authors who write in that milieu. I’ve got my eye on silent era Hollywood! CMK: I’ve read both the original and expanded versions of The Artist’s Touch and now Tested in Fire. I loved both books. What is it about Luke and Stefan’s love story that brought you back to your keyboard for a second installment? AND <please, please, pretty please> are we going to see them again in a third book? CMK: Speaking of Hootie…Peg is my kind of colorful secondary character! She is a sheer pleasure to read on the page. Will we see more of her and Hootie? Anyone who’s read my Legend Tripping series (Stumptown Spirits especially) has already met Peg and Hootie (although Hootie kept a very low profile)! When I was writing Stumptown, I needed a ghost expert for a desperate Logan to turn to. Since I’d already written one (even though she hadn’t yet seen the light of publication), I totally stole my own character and gave Peg a cameo, which means the Legend Tripping and Art Medium series are de facto in the same story universe! And if the third Art Medium book moves forward, we’ll definitely see Peg and Hootie again! CMK:I am in awe of the number of stories you have written since we first met. Tell us a little bit about your writing process and what we may see before the end of the year (if you can)? I’m a micro plotter, which I know sends many of my writer friends screaming from the room. But ever since high school, when before every essay test, my favorite English teacher used to write on the board, “In a well-written and unified essay…” I’ve always had to know where I was going before I could start. I’d look at the essay question, figure out my last sentence, and write to that sentence. When I first started writing fiction, I was still flailing around, trying to find a process that worked for me, and having one heck of a time because all the methods I’d seen used (at most) macro plotting—the three act structure, the Save the Cat beats, etc. But those didn’t help me because they weren’t specific enough. I needed to know what happened next so I could write to that next thing. Then two things happened: I took Suzanne Johnson’s Quilting 101: Patchworking the Perfect Plot, and discovered Todd Klick’s screenwriting book, Something Startling Happens. The combination of these two things (which dovetail perfectly) changed the way I write. If I follow Suzanne’s plotting-through-character-arc method and organize the story with Todd’s Startling beats, I can power through the first draft of a 75K word novel in under a month. Of course revisions and edits are another story! In terms of what’s on the horizon (or near it), I recently released another paranormal romantic comedy, Nudging Fate, in the new Enchanted Occasions series with Dreamspinner Press. They’ve contracted the second in the series, so expect to see Devouring Flame sometime in December or January. My contemporary novella, Mystic Man, also from Dreamspinner in their States of Love collection, arrives on June 22. I’m also working on a new three-book series set in the Fae Out of Water ‘verse. This one (the Supernatural Selection series) is centered around a “supe” matchmaking agency, and features guest appearances by characters from Cutie and the Beast, The Druid Next Door, and Bad Boy’s Bard. The first book, Single White Incubus, should hit the (virtual) shelves in October, with the other two following in November-January. Thanks so much for inviting me to stop by, C! This has been a blast! CMK: Thank YOU, EJ for taking the time to talk with me! Well dear readers, we can all look forward to seeing many more fabulous books from EJ Russell. (Personally, I’m going to beg for a beta read of her silent era Hollywood book!) Happy reading! NOTE: This is a heavily revised and significantly expanded reprint of the author's Northern Light. 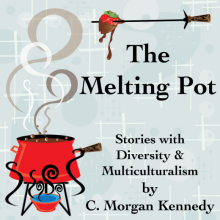 Find C. Morgan Kennedy's prior Melting Pot articles here.